Use the Skyscanner flight search option to find the lowest air fares to and from Lanzarote airport for your desired holiday dates. Skyscanner searches all of the cheapest Lanzarote flights available from the major UK and Irish airports and offers you a number of booking options depending on the time of day you want to travel and the price you want to pay. 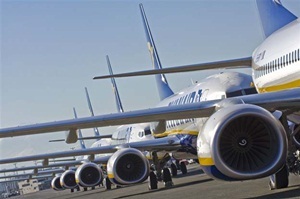 Over the last few years the number of flights to Lanzarote have increased greatly, whilst fares have dropped, thanks to the advent of more budget services to the island with operators such as Ryanair, easyJet and Norwegian. As a result it is now cheaper to get to the island than ever before and flights are available from virtually every main airport in the UK. The flight time from the UK and Eire is four hours, although this can sometimes be reduced to as little as 3 hrs and 20 minutes by wind speed and direction. Arrecife airport is located approximately 4km from the island capital and is also in close proximity to the main resort of Puerto del Carmen. For full information about the airport and its facilities visit our Arrecife airport page. You can also view real time flight arrival and departure information. The island is a year round holiday destination thanks to the excellent weather, so with airlines flying to the island all year long there is usually good availability for most dates. Even in the peak summer season it is still possible to get a flight only deal for a relatively low price. The flight time to Lanzarote is only 4 hours and flights are available on virtually every day of the week, making it easy to find and book flights. If you are planning to tour the Canary Islands then internal flights are also available. Lanzarote airport is well serviced by taxis for independent travellers, but many guests prefer to pre-book either car rental or an airport transfer to ensure they are not left waiting and can get their resort or accommodation nice and smoothly. You can pre-book a rental car on our car hire page or alternatively visit our airport transfers section. Why not book your entire holiday online with us too? We offer a comprehensive our selection of villas, hotels and apartments - in both the main resorts and all other key locations across the island.